‘This is what I thought he’d be. A spectacular fright. I was wrong. I had made the mistake of hearing the word devil and immediately imagined horns. But did you know that in Wisconsin, there is a lake, a wondrous lake, called the Devil? In Wyoming, there is a magnificent intrusion of rock named after the same. There is even the most spectacular breed of praying mantis known as the devil’s flower. And a flower, in the genus Crocosmia, known simply as Lucifer? Wow. 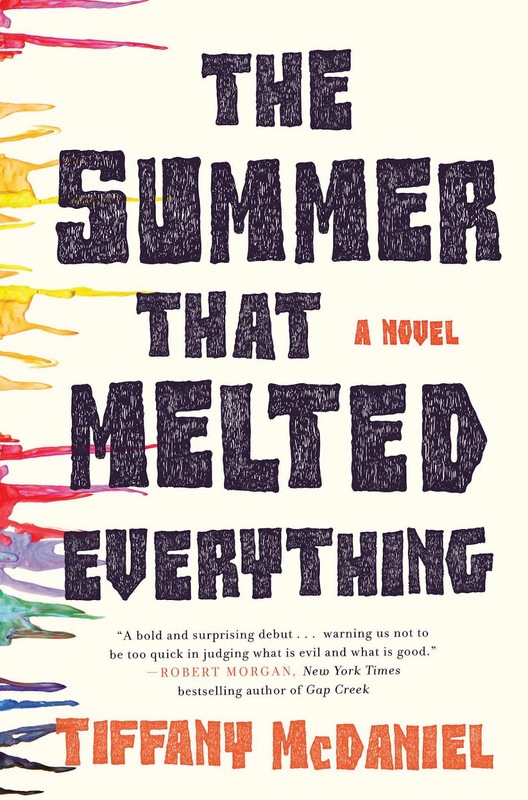 The Summer That Melted Everything is absolutely unlike anything I’ve read before – this book blew me away. You may see the title and immediately think that this is a warm, light-hearted YA contemporary. If you did think that, you probably couldn’t be more wrong. The Summer That Melted Everything is deep, dark and gritty; it’s filled with suspense and delves into some important issues (specifically religious extremism, racism and homophobia amongst others) which are still so relevant today despite the book mostly being set in the 1980’s. The plot centres around Fielding Bliss’s reminiscences of the summer of 1984 – the year when his Father invited the devil to their town of Breathed, Ohio. At the beginning of the summer, Sal turns up, claiming to have answered this invitation, and brings the blistering heat with him. He almost instantly becomes the fifth member of the Bliss family, but not all citizens of Breathed are as welcoming towards him. The heat begins to take it’s toll, and although the town may not have expected the devil to look like a thirteen year old boy, they begin to believe that appearances can be deceptive. So many mysteries surrounded this book whilst I was reading, and many still do – who was Sal, really? Could the events of summer 1984 in Breathed, Ohio have been avoided if he hadn’t turned up on the Bliss’s porch, or if Autopsy Bliss hadn’t invited the devil to the town in the first place? Last but not least, why was Sal so obsessed with ice cream? I thought that the way social issues were used, in comparison to the mindset of many in the 1980’s, worked so well. Sal is subjected to so much racism throughout this book, and the citizens of the small town of Breathed compare his race to his claims of being the devil from the very beginning. Despite the devil being a thirteen year old boy, the members of the growing cult within the community are able to demonise him because of the colour of his skin. I can’t express how perfectly this book was written. Not only the plot and the characters, but the writing itself flowed so well throughout the book, and I couldn’t put it down. Each sentence was like it’s own small poem and the metaphors worked so well. I feel like I’ve only scratched the surface of this book from reading it once, and I can’t wait to read it over and over again to uncover more of the secrets that are hidden throughout it. Overall, The Summer That Melted Everything is such a darkly beautiful book – in my opinion, it’s the perfect debut, and I feel so honoured to have been able to read it. I went into this book without having a clue what it was about. I usually hate doing that but in this case, it worked in my favour because it isn’t usually a book I would think about picking up. This novel tells the story of Fielding Bliss as he reminisces and tells the story of his summer in Breathing, Ohio, 1984. That is the year he became friends with the devil. I wouldn’t even know what genre to fit this book into. Adult fiction? Magic realism? Historical Fiction? All I know is that from the first page, I was hooked. It has some heavy themes such as racism, homophobia, religious extremism and mob mentality but it still entwines itself with some happy moments between family and also what it means to be family. The Bliss family accept the devil (A.K.A, Sal) as their own and this leaves us with the age old question, why do we assume the devil is the bad guy? What if he’s just a young boy with a love for ice cream. Fielding tells his story as an old man, scared of letting people close to him, he tells the story of his brother Sal, the devil in dirty overalls. Grand, his brother struggling with his sexuality. His mother who is afraid of the rain and his father, Autopsy who invites the devil in the first place. The familial relationships in this book were perfect. Fielding who is as much in love with his big brother as it is possible for a young boy to be. Stella and Autopsy who protect and love Sal despite everything. Sal who helps Stella leave her house and to not be scared of the rain. It is so important to read a novel in which a love between a family is this strong. Fire burned throughout the entire novel, from start to finish. This is not a happy book and it certainly doesn’t end happily. This is the story of a summer in which the heat took everything. Nobody left unscathed. It shows us that we are all capable of monstrous acts, sometimes monstrous acts which are necessary. My heart ached for some characters and my blood boiled because of others. I felt every emotion reading this book and I would recommend it to anybody. I’ve never read a book like this and I’m so glad that I was given the opportunity to. Overall, Tiffany McDaniel managed to write a book with such heavy themes that it could have failed but instead she wrote a book with a whimsical, yet dark feel and at the centre, this beautiful family who love each other, faults and all. The devil really is in the details of this book. I want to read it again. I want its words tattooed on my skin. Congratulations to Tiffany on this spectacular debut that will live with me for a very long time. We also got the amazing opportunity to interview the brains behind this beautiful novel. The familial relationships in this novel were very strong, even to the point that the Bliss family immediately accepts Sal as one of their own. Did you purposefully set out to write a book with a family being at the heart of it? When I wrote the first line in the novel, I didn’t think family would end up being the heart of the story. I thought this is a story that is going to invite attachment from the town and beyond. I thought it was going to be a story where the events were shaping people at a national, if not worldly stage. But then it came back to the Bliss family. The story really doesn’t exist without them and their bond. The father, the mother, the sons, and Sal included in that. Family became the answer to the opposing side. Family became that which bore the brunt of the events, but it is also that which made the events matter. Family is the universal statement of love, after all. What inspired you to write about the devil? More specifically, a devil who isn’t monstrous and goes against its stereotypes? I always say the characters themselves inspire me. They feel very real to me. As if they exist and in some other plane or bend of the universe I may one day be able to touch them and feel them touch back. So I didn’t have a plan to write about the devil. Sal came along and really made that a reality. I didn’t want a devil who was stereotypical. We know that story already. We know how that story begins and ends. If I was going to write about the devil, that devil was going to be someone who broke the stereotypes. We’ve seen the monster before. It’s time to see what else there is. Unfortunately, I wasn’t born until the late 90s so I have no personal knowledge of this time and yet I felt nostalgic for a place I’ve never been. Was this story always going to take place in the 80s? When I thought of the time period this story would take place in, I immediately thought of the 1980s. To me it always seems like the 80s were a decade-long summer with its neon colors, big hair, and big ambitions. Maybe this is a stereotype of the decade. I was born in 1985, so I can’t attest to how true this really is, but there really is no other time for the story to take place in. The 1980s is that summer’s true home. Why did you choose to start each chapter with an excerpt from Paradise Lost? Did this work inspire the story or did you add it later? I was thinking of how I wanted to begin my chapters, because I always title chapters in my novels. And Milton’s epic poem immediately came to mind. I had read it for the first time in my early twenties in college. It’s one of the works I was immediately attracted to because it was about that which has always fascinated me, that being the fall and the balance between good and evil. I can only hope that my inclusion of the quotes in my novel would make Milton proud. I only hope I have done right by him and his words, which far surpass my own. I love that Sal was a POC. Did you always see him as such? Do you think his story would have ended differently if he hadn’t of been? I did always see Sal that way. When he appeared in my mind, he did so incredibly clear in his overalls and with his bruises, his dark skin and green eyes. I always say my characters are themselves. I’d like to say I created Sal, but I feel like he just existed and I’m the vessel through which his story is brought into our world. If Sal hadn’t of been who he was, his story and really everybody else’s story would have without a doubt ended differently. Sal was what happens when we lose to our own ignorance and when racism wins. The one question we all want to know the answer to. Why did Sal want ice cream so much? This is so difficult to answer without giving spoilers away, but a little hint: Think of Elohim and what he was doing. Sal was not really asking for ice cream when he asked for ice cream. He was saying something much bigger about the reasons for the melt, and the melt yet to come. And finally, if your readers could take one thing away from this book, a message or a moral, what would it be? That we are only as godly as the love we give. We are only as devilish as the hate we spread. 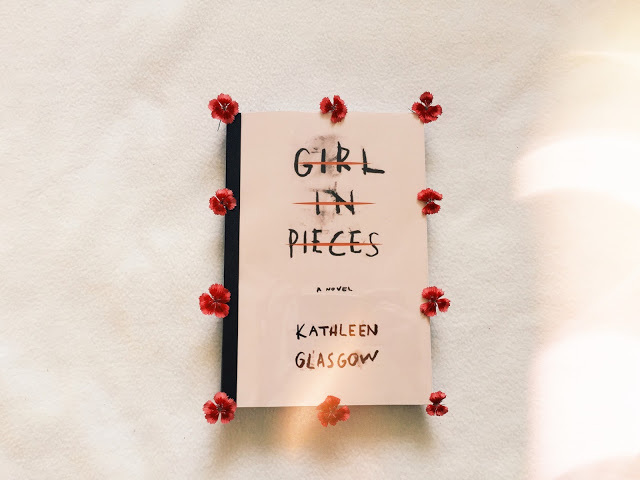 Recently, Angharad had the privilege of interviewing Kathleen Glasgow, author of the upcoming release Girl in Pieces. We were both incredibly moved by this book, so it was great to be able to get an insight into the ideas behind it’s story! Q: One of the things I loved most about this novel were the fantastic female characters; not just Charlie herself, but also Louisa, Blue, Linus etc. Did you already have these secondary characters fleshed out at the start of the story or did they come to you later on? Are they based off real life people? A: Fun fact: Charlie started out in early drafts with a twin brother! And she had a friend, Michelle, who morphed into Ellis in later drafts. 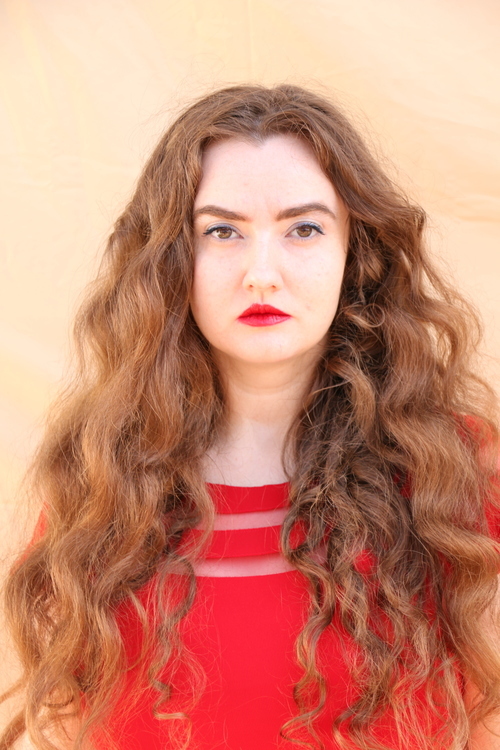 They aren’t based off real-life people, but when I was writing them, I was very conscious of the fact that I really wanted to explore the nuances of female friendship – how you can love your best friend so much, but feel intense jealousy for them at the same time, and sometimes be mean to them as a result. Blue was fun to write because in a way, she’s a hero by the end of the book — she has layers that are revealed gradually, and she becomes a beacon of kindness in Charlie’s world. Sometimes the most unlikely people can become our biggest allies. I wrote the character of Linus partly to give Charlie an adult who could recognise what was going on in Charlie’s relationship with Riley, and to guide her. Q: This story doesn’t only delve into the dark world of self-harm but also touches on addiction, homelessness, abuse etc. Were you frightened about writing such heavy subjects and yet keeping that layer of hope that runs throughout? A: I wasn’t righted about writing those heavy subjects. I was more nervous — I wanted to do them justice and treat them honestly and not shy away from their truths. But I also wanted to make sure to keep an element of hope — that it is possible to find your way out of darkness, it is possible to recognise and accept help and friendship. You don’t have to have suffered through what Charlie suffers to understand this book — you will find yourself, or someone you know, in its pages. Q: Charlie finds solace in her art. Did you find solace when writing this book? Was it important for you to share your story with the world? A: Charlie’s story isn’t mine, though I did give her bits of my own experiences in life. I did find solace in writing her because I knew that her story would reach at least a few people who needed to hear it. The most important thing to me was writing the story of a girl learning to live in the world. Because it’s hard to be a girl, and then a woman, in a world that doesn’t value your intelligence, or your emotions, or your dreams. Q: An age old question but probably the most thought of. Which character did you enjoy writing the most? A: Ha! Well, I liked writing Blue, because I tried to give her little nuances, like the fact that she’s a big reader, likes Lady GaGa, etc. And I have a secret crush on Evan, because he is that guy who would give you the shirt off his back in a blizzard. But of course my favourite character to write was Charlie: she’s messy, she’s beautiful, she’s lovely, she’s smart, she’s sad, she’s brave, she’s hopeful, she’s a spinning top, she’s scared, she has life force to burn, I would be her friend in a heartbeat, I love her, and I want her to have a good life. Q: What message/reminder would you like people to take away with them after reading this book? 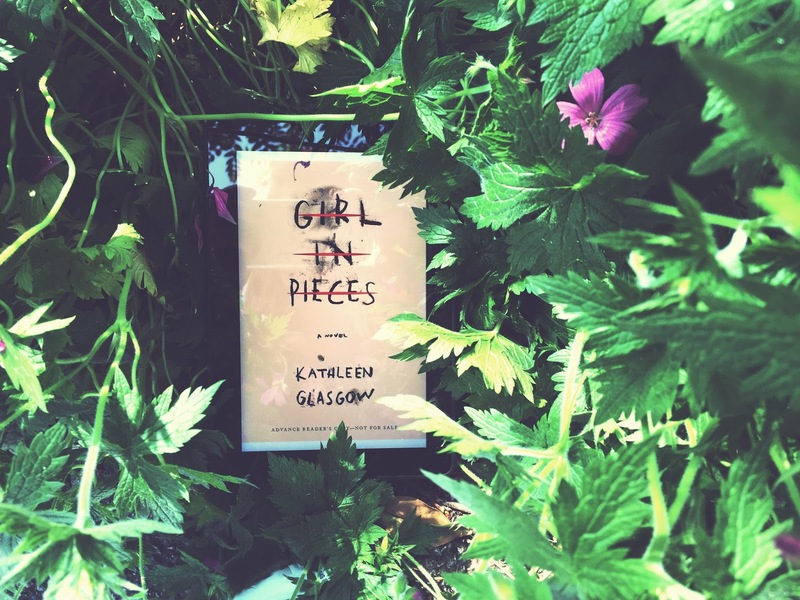 Girl in Pieces is released in the UK and US on the 30th August 2016.